The Missoula County Elections Office has staffed its 28 polling stations with 550 election’s judges today to ensure the voting process runs smoothly and lines for same-day registration stay manageable. (Photo by Martin Kidston). Passing spring showers on Tuesday afternoon did little to dampen voter enthusiasm at polling stations across Missoula, where turnout is on pace to reach near-record levels. The Missoula County Elections Office has fully staffed election headquarters at the Missoula County Fairgrounds. Across the county, more than 550 election judges are on hand to ensure the process runs smoothly at the county’s 28 polling stations. Given the state’s open primary, voters on Tuesday have a choice in casting a ballot for either the Democratic or Republican party. While each of the parties’ presumed presidential nominees have already been announced by national media, local voters still have a say on the Missoula County commissioner’s race, the state supreme court, various legislative districts, the governor’s race, judges and the Montana Public Service Commission. 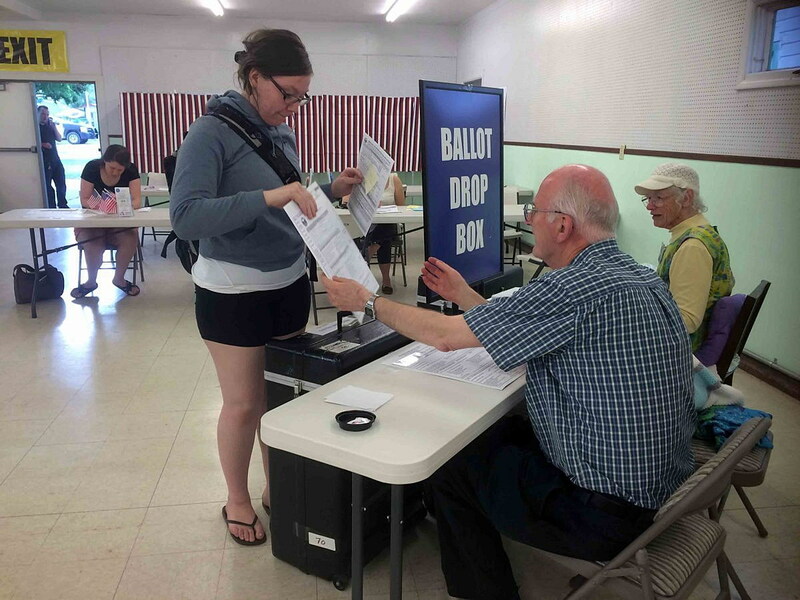 Same-day registration was important to several voters, including Tom Cerino and Beth Tackett, who both registered over their lunch break on Tuesday. According to election staff, the county has issued 33,108 absentee ballots this year. As of noon on Tuesday, 21,704 of those – or roughly 66 percent – had been returned and accepted. Some 28 absentee ballots have been rejected, 435 were undelivered and 214 have reissued or replaced. With an estimated 55,000 active registered voters in the county, polling stations are also busy. With an increase in staffing and new machinery used to process ballots, elections officials expect to release early results at around 8:15 p.m.
Those who haven’t registered to vote but want to must bring a valid Montana driver’s license or their Social Security number to the election headquarters at the fairgrounds. Polls close at 8 p.m.